I’ve always been a fan of Prada accessories particularly the understated style of their men’s single clip nylon messenger bag. Minimal design with black military nylon, etched black leather trim, the stainless steel clip and of course the triangular metal Prada logo. I’ve been the proud owner of three Prada messenger bags. The first one went with me everywhere — to work Monday through Friday and on my travels around the world. I wore it to the ground. The second time around I went for a dark blue bag with brown leather trim. Prada only released this model for one season and I haven’t seen one since. The third one was like the first, exactly the same one, except this one was brand spanking new. I got to a point when I needed to carry more things with me each day. The Prada bag got to be a little too small so I switched to a more traditional messenger bag by Brooklyn Industries. Great bag. It became my workhorse bag carrying everything from groceries to my Chihuahuas. I was using the Brooklyn Industries bag for work and as roomy as it is, it lacked a functional organization on the inside that I needed. 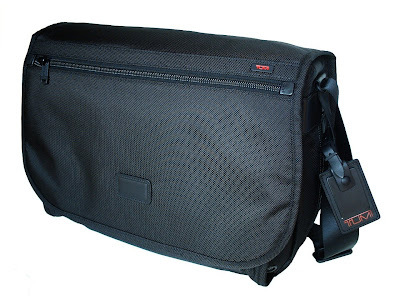 Last weekend, I bought a Tumi messenger bag. The bag is handsome, well-made and super-functional with lots of compartments for my stuff — and I carry a lot of stuff. The Prada bag wins on overall style but the Tumi gets big points for its functionality and for keeping my things organized. It’s a good bag for work and for about a quarter of the price of a Prada bag, this Tumi is a keeper.